tales: ('teilz) a narrative that relates the details of some real or imaginary event, incident, or story. Whether it's one Christian has read or one that has been developing in his head, the tale has always been one of his biggest inspirations. 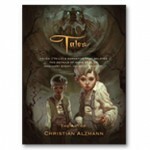 Tales: The Art of Christian Alzmann is Christian's first book collecting his digital paintings and sketches as well as his traditional pencil sketches. He also walks the reader through his digital painting process using Photoshop and Painter. Categories: Books, we made too much on the reprint. Tag: christian alzmann.